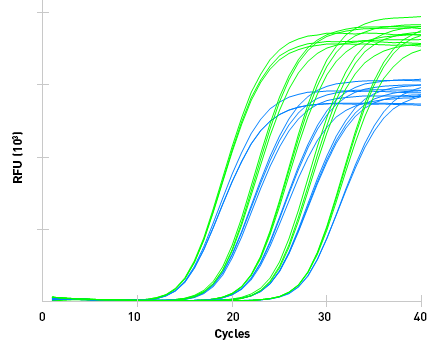 Sahara Multiplex qPCR Master Mix is a 2X mix for probe-based Real-Time PCR. 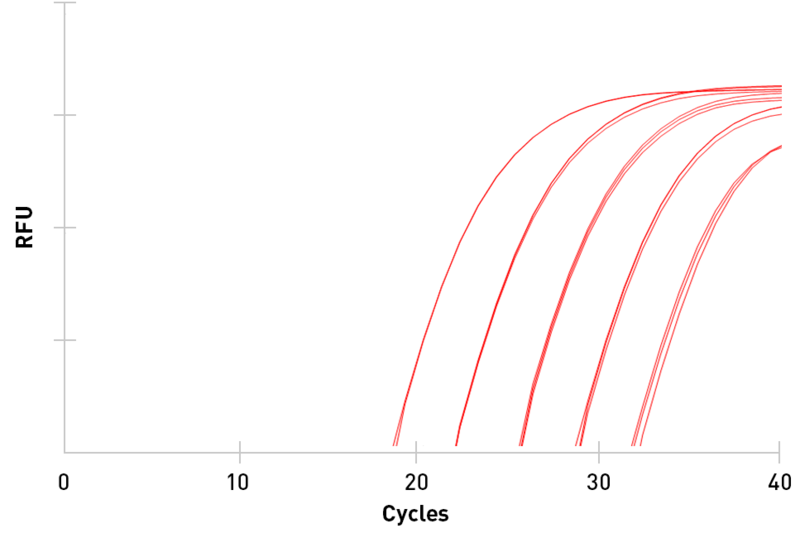 It quantitatively amplifies singleplex and multiplex (up to 4-plex) qPCR targets at high efficiency from purified samples and crude extracts. Stable at 50 °C for 8 days, or 25 °C for 3 months, Sahara mixes ship economically at ambient temperatures, prevent Cq drift over time due to thermal degradation, and are ideal for high throughput or field applications where temperature control is not always ideal. 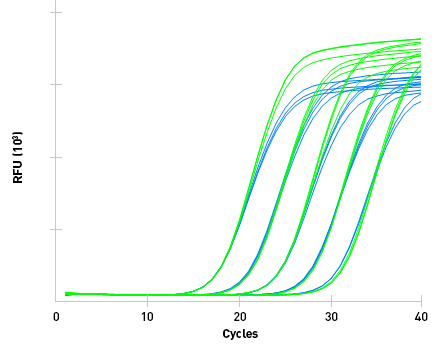 Sahara Multiplex qPCR Master Mix has been validated against genomic, plasmid, and cDNA targets from a wide range of organisms. The mix supports both standard and fast protocols, and amplifies GC-rich targets up to 70%. 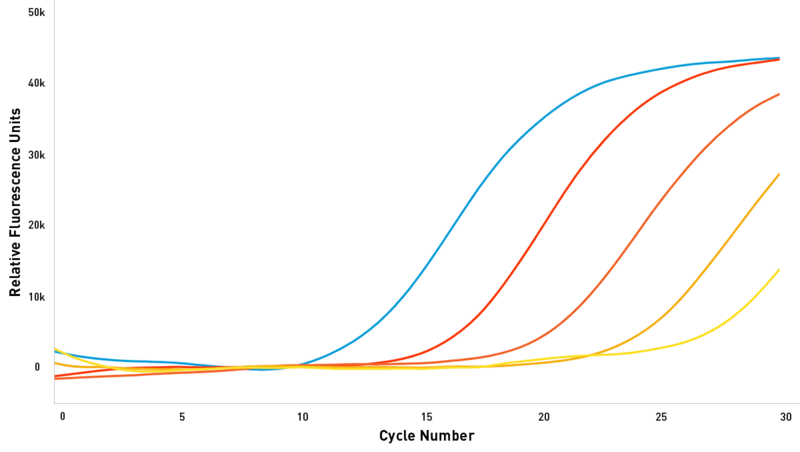 Multiplex qPCR often suffers from competitive inhibition, where a high copy number target amplifies early, consuming reactants that prevent lower copy number targets from amplifying. 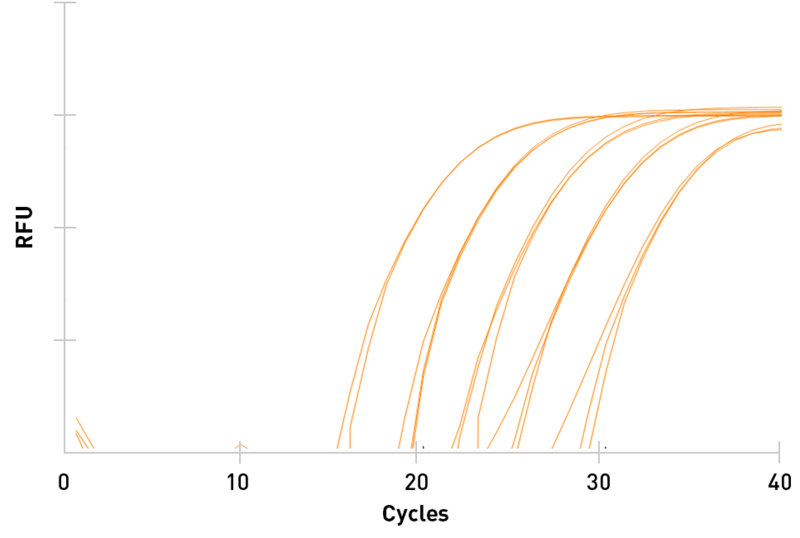 With high levels of Taq, dNTPs, and multiplexing enhancers, Sahara Multiplex has been demonstrated to amplify four multiplex targets simultaneously, with no change in Cq when compared with singleplex reactions. 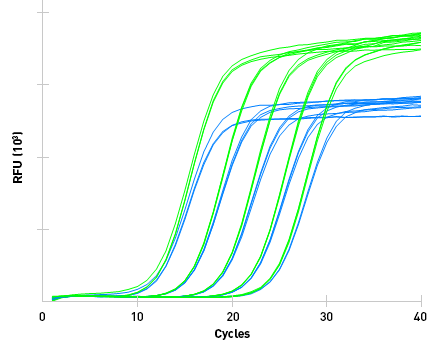 Set up reactions with ease at room temperature: an aptamer-based hotstart system prevents amplification from occurring below 50 °C, while a blue non-interfering loading dye helps avoid pipetting errors. When activated by the addition of UNG, a dUTP carry-over prevention system prevents false positives from amplicon contamination. The mix ships with an optional ROX reference dye, allowing it to be used with high, low, and no-ROX qPCR instruments. 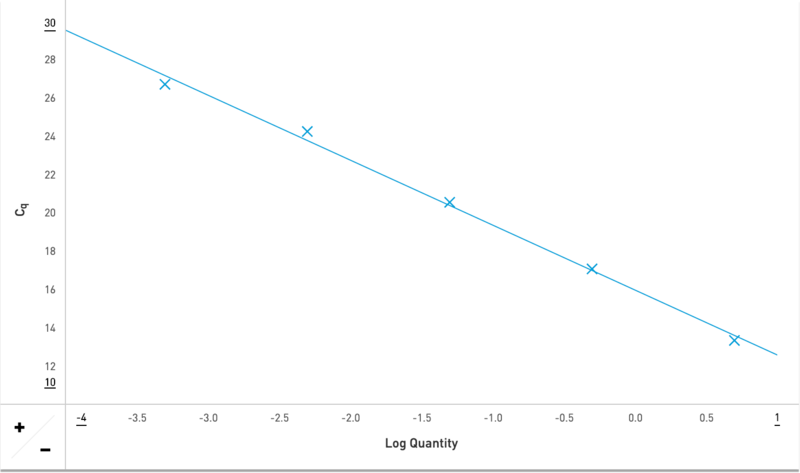 Dynamic range of 1010 is demonstrated while maintaining excellent efficiency and linearity using Sahara Multiplex qPCR Master Mix to amplify a 157 bp gene fragment on an Open qPCR instrument. 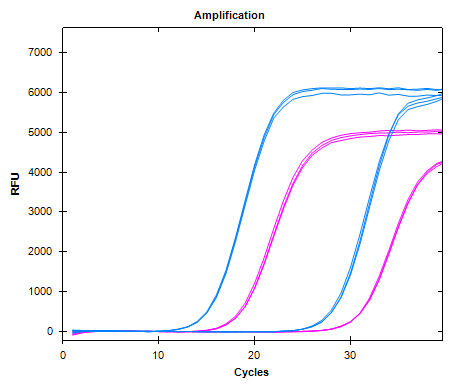 Four targets were amplified simultaneously using Sahara Multiplex qPCR Master Mix on a Bio-Rad CFX Touch instrument. 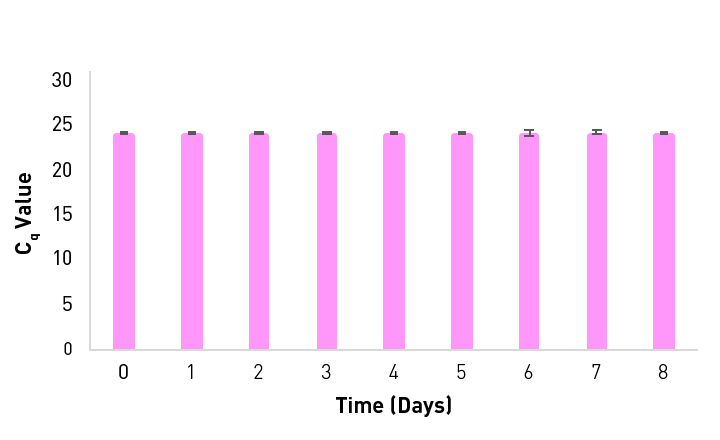 10-fold dilutions of all targets achieved excellent linearity & efficiency. 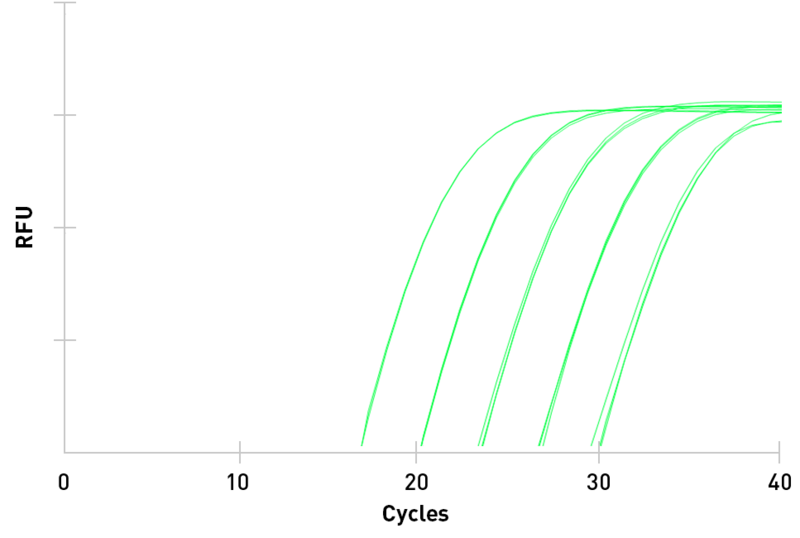 When singleplex and fourplex reactions are compared, minimal shift in Cq values are observed for all dilutions of targets. Sahara Multiplex qPCR Master Mix was stored at 50 °C, and a fourplex reactions were run daily on Bio-Rad CFX96 Touch instrument. No difference in Cq is observed throughout the trial. A fast 19 minute protocol was run on an Open qPCR instrument, obtaining excellent linearity & efficiency. 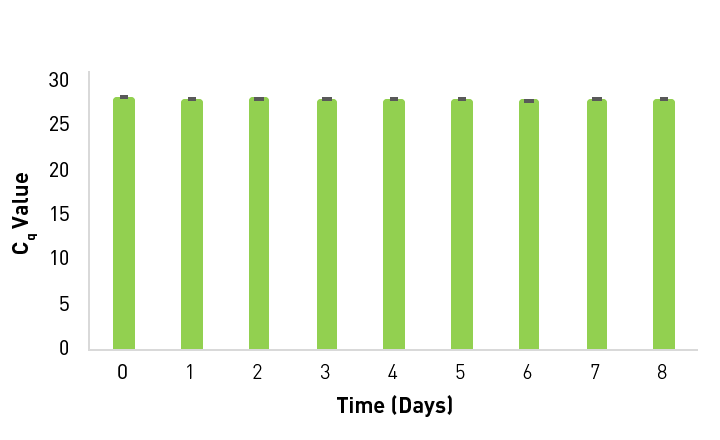 Protocol: Initial denaturing 30s @ 95 °C, Cycle 30x: 3s @ 95 °C, 14s @ 60 °C, 5 C °C/s ramp times. At left, a challenging 67% GC Salmon sperm assay was run with and without Sahara Multiplex qPCR Master Mix’s hot start aptamer. 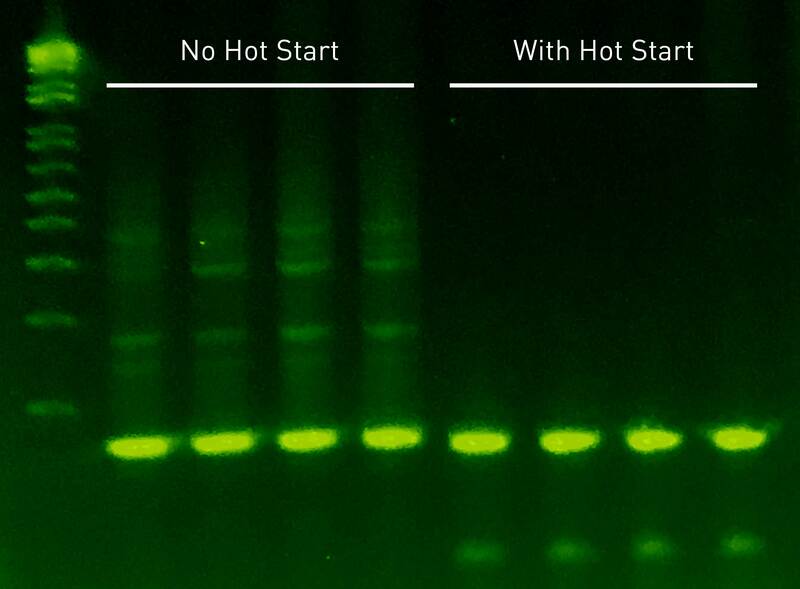 The aptamer hot start successfully prevents the non-specific products seen in the non-hot start assay. The extra small band in the hot start formulation is the disassociated aptamer. 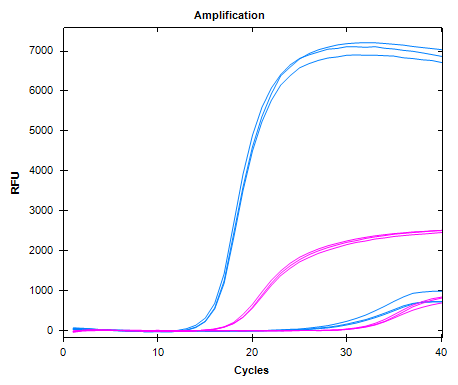 At right, a duplex assay targeting Enterococcus gDNA (pink) and Yeast gDNA (blue) was run with and without the aptamer hot start. The assay lacking hot start (top) produced inconsistent plateaus and poor curves due to non-specific amplification. 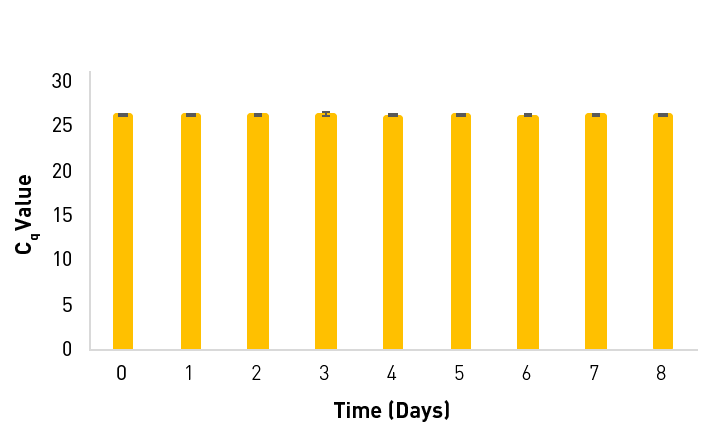 The hot start assay (bottom) produces consistent plateaus for high and low dilutions of target. View all related knowledge-base articles. Chai encourages commercial use of its products. 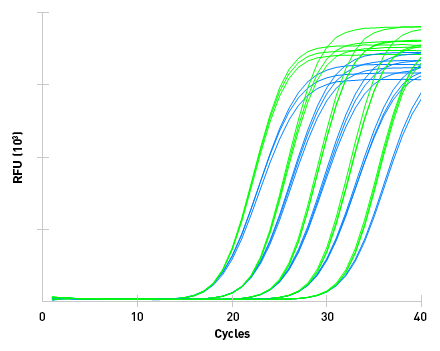 Sahara Multiplex qPCR Master Mix may be used commercially license-free, and is available in bulk quantities for OEM applications. Samples are available to institutions in the US and Canada upon request. Please fill out the form below and we’ll respond as quickly as possible.